Gov. Andrew Cuomo's proposal to legalize marijuana was dropped from the state budget in March, signaling an official shift in lawmakers' approach to the issue. Gov. 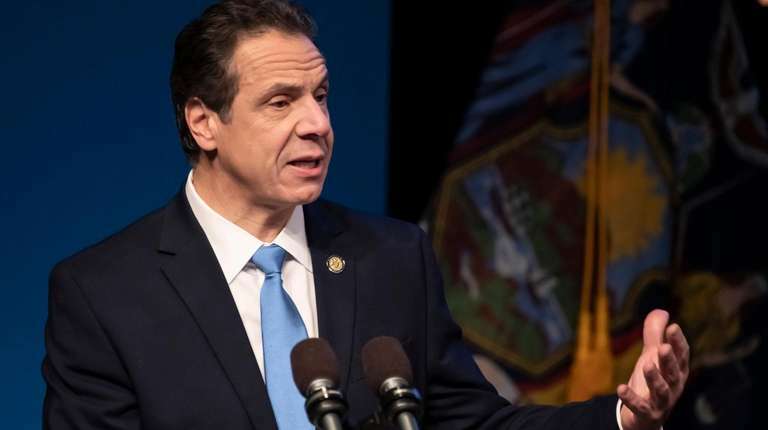 Andrew M. Cuomo outlined a plan to legalize marijuana in 2019 during his state budget address, but has since conceded the issue would have to wait for individual legislative action. Photo Credit: Newsday / J. Conrad Williams Jr.
Will New York become the 11th state to legalize the recreational use of marijuana? For more than a year, city and state officials have taken steps toward possible legalization, with public listening sessions and government reports leading to legislative efforts to produce a bill. The City Council passed a bill on April 9 that prohibits employers from requiring a prospective worker to submit testing for the presence of the active ingredient in marijuana, known as tetrahydrocannabinol or THC. Lawmakers also approved legislation that bans the city from requiring marijuana testing for people who are on probation. Last month, the City Council passed resolutions that call for all misdemeanor marijuana convictions to be expunged and for the state Legislature to pass legislation that fully legalizes, regulates and taxes the drug. On a state level, Gov. Andrew Cuomo's proposal to legalize marijuana was dropped from the budget in March, signaling an official shift in lawmakers' approach to the issue. Cuomo and state lawmakers suggested legalization could still be achieved in the 2019 legislative session. “I think it was clear early on that the legislative leaders signaled that it was going to be [done] outside budget," Cuomo had said. "I think the speaker was quite clear of that, that it would be best to do it outside the budget, that it was complicated and it will take time." The majority of voters in New York support legalizing marijuana, 57-38 percent, according to an NBC 4 New York/Marist poll released on March 6. The issue is largely split along party lines, with 65 percent of Democrats and 58 percent of independents in favor of legalization and 60 percent of Republicans against it, the poll found. In January, a poll released by Quinnipiac University showed that not only do a majority of New Yorkers back legalizing marijuana, they also support erasing past criminal convictions for possession. “There are some concerns being expressed, for example, about potential increase in car accidents, but overall New Yorkers say they would be in favor of legalizing marijuana and also be OK with it sold in their communities," Quinnipiac poll analyst Mary Snow said. Some lawmakers refused to support Cuomo's budget proposal, which would have set the legal age to consume marijuana at 21, unless it included more details on how tax revenue from the cannabis industry would benefit people of color, who have been disproportionately arrested on marijuana charges. Though Cuomo's plan called for a "social and economic equity plan," it did not have specific details. "They thought we were going to trust that, at the end of the day, these communities would be invested in. But that’s not something I want to trust," Assemb. Crystal Peoples-Stokes (D-Buffalo) told The New York Times. "If it’s not required in the statute, then it won’t happen." Peoples-Stokes introduced a bill that would require that half of all marijuana revenue go into a community fund that would support job training and prioritize licenses for people of color. Another element that had local leaders, including the state Association of Counties, asking questions was Cuomo’s plan to allow major cities and counties the ability to opt out of the law. Cuomo's decision to include marijuana legalization in his budget followed a series of public hearings in 2018 that endorsed decriminalization efforts after the state Department of Health issued a report advocating a change in law. The six-month Health Department study, commissioned by Cuomo, was released in July and determined that the benefits of legal marijuana outweigh the risks. The department also determined that legalizing the drug for New Yorkers older than 21 would not significantly raise smoking rates and could help reduce racial disparities in police enforcement. Medical marijuana remains legal in New York State for patients who are certified by medical practitioners as having serious conditions, under the Compassionate Care Act. The conditions include cancer, AIDS and severe chronic pain, among other ailments. Where does Mayor Bill de Blasio stand? De Blasio, who had not previously endorsed full recreational legalization, reversed course with the release in December of the 71-page report from the Mayor's Task Force on Cannabis Legalization. "We have a once-in-a-generation opportunity to get a historic issue right for future New Yorkers," de Blasio said in a letter attached to the report. "Legal cannabis is coming to New York State." The task force recommends the taxation of marijuana sales in New York City, restriction of purchase and possession to those 21 and older and expunging of marijuana-related convictions. The mayor had previously backed efforts to reduce the effects of marijuana enforcement, and as of Sept. 1, most New Yorkers found smoking in public faced criminal summonses, rather than undergoing an arrest. "Nobody’s destiny should hinge on a minor nonviolent offense," de Blasio said in June when announcing the policy change. "Neighborhood policing has helped to bring officers and community together, but we still have more work to do to right the wrongs in the criminal justice system. This new policy will help reduce unnecessary arrests, while making our city fairer and safer." Convictions for marijuana possession have dropped drastically in Manhattan and Brooklyn as their respective district attorneys pursue decriminalization efforts. Starting Aug. 1, Manhattan District Attorney Cyrus Vance Jr. stopped prosecuting low-level marijuana possession and smoking cases, with two exceptions: Those who possess 10 bags or more of marijuana for sale, and those who demonstrate a public threat. In addition, close to 3,000 outstanding misdemeanor marijuana possession and smoking cases that date to 1978 have been dismissed and sealed. Vance's office said 79 percent of those cases concerned people of color. Brooklyn District Attorney Eric Gonzalez has continued a pilot program that largely excuses low-level marijuana smoking arrests. The number of cases accepted for prosecution in Brooklyn went from 349 in January to 29 in June, a 91 percent drop. On Dec. 19, for the first time in the state's history, Gonzalez vacated 28 low-level marijuana convictions through an initiative he began in September. Manhattan saw a similar decline in the first quarter of its new policy, with a 94 percent drop in marijuana prosecutions from Aug. 1 to Oct. 31. "Now it's time for New York State to legalize, regulate and expunge," said Vance. "District attorneys in Brooklyn, St. Louis, Philadelphia and Manhattan have shown that prosecutors can safely exercise their discretion and eliminate the needless collateral consequences associated with the criminalization of marijuana. But this shouldn’t be up to district attorneys alone — only our legislature can do justice for all 62 counties in New York State." How would tax revenue be used? Cuomo and de Blasio said in February that they support using some of the revenue generated by taxing legal marijuana to help fund the MTA. As part of a 10-point plan to fix the transportation authority, the politicians suggested that revenue raised from congestion pricing, internet sales tax and marijuana legalization could bring $22 billion in bonds for MTA transit investments, which could be put toward the next five-year capital plan. Newly elected Public Advocate Jumaane Williams said during his first news conference in early March that he does not think the revenue should be funneled into the MTA, "period." Several state lawmakers have said the revenue should directly benefit communities most affected by the criminalization of the drug. Is CBD legal in New York?CBD has shown promise as a therapeutic product but its effectiveness is still being researched. Weed for rails? PA candidates spar over marijuana taxesSuch proceeds remain hypothetical until state legislators act to legalize. Marijuana legalization on Assembly's agenda in ManhattanState Assembly committees are meeting in advance of the 2019 session. Marijuana is ‘for the people,’ legalization advocates sayMembers of the public are invited to hearings on the possible decriminalization of the drug.